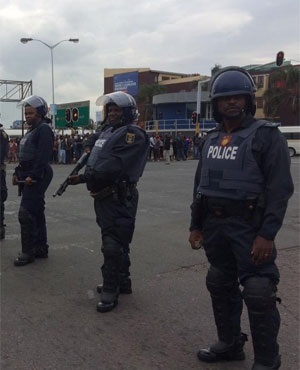 Durban - KwaZulu-Natal Community Safety MEC Willies Mchunu called for calm as riot police and foreign nationals clashed in the Durban city centre on Wednesday. Riot police used water cannon, stun grenades and teargas to disperse a group of over 300 foreign nationals who gathered to protest a spate of xenophobic violence in the eThekwini region. Police had halted a planned march, insisting that they could not guarantee the safety of the protestors. Despite several clashes with police, a handful of marchers and the leaders made it to the Durban City Hall where they were met by Mchunu, girthed by a squad of riot police. Speaking to community leaders, Mchunu said dialogue would be key. “We are ready to listen to all of your concerns and address them and that is important to us. We [the provincial government] need to explain what we are trying to do with the present situation,” he said. “I have just come from Isipingo and I don’t understand why people are saying that the government is doing nothing,” he added. Isipingo, south of Durban, has been a flashpoint of xenophobic violence and hundreds of foreign nationals have sought refuge in a local police station. “We are Africans and so are you. There is no issue with that. The best thing to do now is to diffuse any tensions and ensure that this whole matter is handled in a matter that is safe. We will sit down across a table and talk about the issues. In that meeting we will discuss all the problems,” he said. Traffic within the city had been adversely affected by the march. KwaZulu-Natal police spokesperson Major Thulani Zwane confirmed earlier that Chatsworth residents attacked foreign nationals staying in an informal settlement on Tuesday night, forcing them to evacuate. "The community members also burnt a shack belonging to a foreigner. Chatsworth SAPS members assisted the victims and tried to move them to a place of safety but they refused stating that they are afraid to be deported," Zwane said. A 42-year-old man was injured during the attack. In Sydenham, about 100 residents also attacked foreign nationals at an informal settlement. "[Police] tried to assist the foreigners who were under attack and the community members began throwing stones at the police," Zwane said. "SAPS fired rubber bullets to disperse the unruly crowd. One unidentified foreign national was injured and taken to hospital for medical treatment. The community members were demanding all foreigners to evacuate the informal settlement. The police managed to contain the situation." - Were you there? Send us your eyewitness accounts and photos.